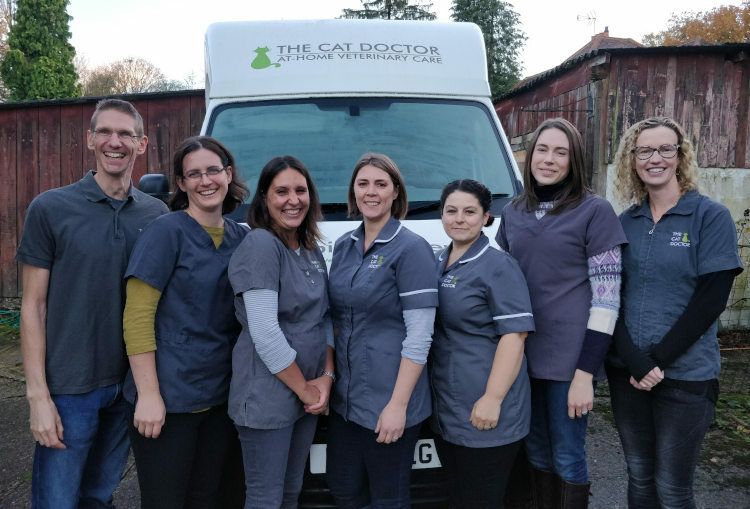 Nikki qualified from The Royal Veterinary College in 2003 and has spent the last 15 years working in and around London, including London’s first cat-only clinic. She has always been fascinated by cats and in 2014 she completed her certificate in feline medicine. 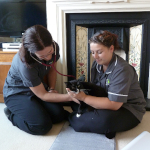 Nikki enjoys writing about cats and has published numerous articles on caring for cats both at home and in a veterinary practice. People always seem surprised when I tell them that I enjoy feline dentistry… after all it can be a long and seemingly messy job! However there’s nothing more satisfying than helping a cat in pain by pretty much instantly alleviating their discomfort with one procedure. Daisy is a perfect example of this. Daisy is a very special cat, as she had been rescued as a stray from France after being hit by a car at only six months old and having to have her leg amputated. The whole town had come together to pay for her surgery, and now she is living a happy life with her new owner in the UK. Amy visited Daisy after her owner had called up saying she was behaving strangely, vocalising and appeared to be in discomfort. She had been eating abnormally, pawing at her face and rubbing it on the furniture. 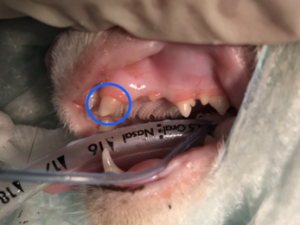 The only thing found on physical examination was a fractured canine tooth, but the owner wasn’t sure when this had happened (as is often the case with our mystery kitties). 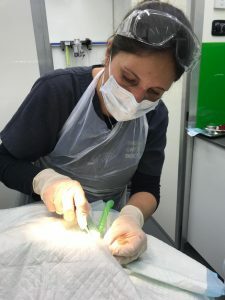 Amy dispensed an anti-inflammatory pain medication and a dental procedure was booked straight away to ascertain the extent of the dental disease and find out if it really was the fractured tooth that was causing Daisy’s distress. 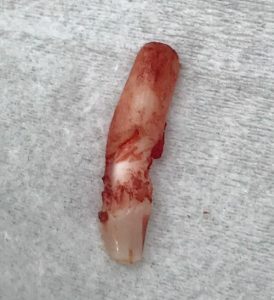 Daisy’s broken tooth prior to extraction – ouch! Daisy, about 20 minutes after her dental procedure, awake and ready for her lunch! On a chilly October morning Daisy entered into the warm comfort of The Cat Doctor’s mobile surgical unit. She was given a pre-anaesthetic assessment by Molly – one of our Registered Veterinary Nurses – which included recording her resting blood pressure, heart and respiratory rate. Daisy was placed onto intravenous fluids (or a drip as it’s commonly known) to maintain a healthy circulation throughout the procedure – and then she was anaesthetised. Full mouth dental radiography was performed on Daisy. This is an exciting addition to The Cat Doctor’s services as it allows us to assess the roots and periodontal ligaments of the teeth which cannot be fully assessed just be examination alone. Daisy was lucky in that the only dental issue she had was with the fractured canine, but many cats have dental disease that is not obvious on initial assessment. Cats can suffer from tooth resorption where oral bacteria start to erode the crown away from the root – culminating in the complete loss of the crown. This can look just as if the tooth is missing, but the reality is that beneath the gumline sits a painful and exposed root which needs surgical extraction. After the full-mouth radiographs, we probed each tooth for any pocketing, lesions or bleeding of the gums indicating gingivitis or periodontitis and then charted all of our findings on a feline specific dental chart, which forms part of the oral assessment records we now hold for Daisy. 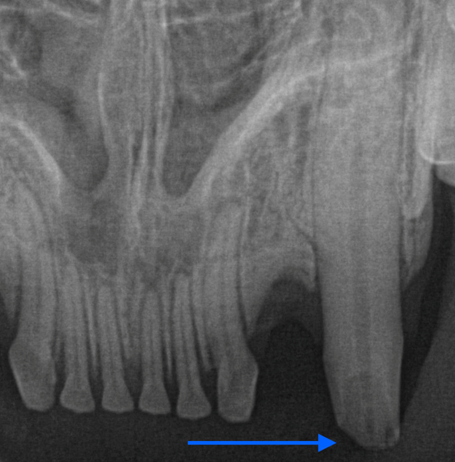 It was clear from probing and on the dental radiograph that the canine fracture was a bad one! It was exposing the pulp cavity – the soft centre of the tooth containing the nerve endings – and so needed to be extracted. In some situations, if we know that the tooth has only just been fractured the patient can be sent to a specialist veterinary dentist for root canal treatment. As we weren’t sure over what time period this had occurred with Daisy, extraction was our best option. Even just lightly probing the area led to Daisy’s heart rate and blood pressure increasing under the anaesthesia, which demonstrated the level of pain she was experiencing. 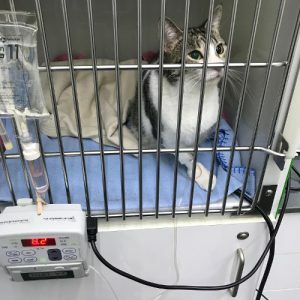 As cats are usually masters of disguise when it comes to pain, often this change in parameters under anaesthesia is the only indication we will have that a tooth is uncomfortable. The next step in Daisy’s dental procedure was to clean the entire mouth, much as you would do in preparation for any surgical procedure. Each tooth was descaled using an ultrasonic descaler which clears the surface of the tooth from any tartar, both above the gumline and just under the gingival margin of the tooth. A local anaesthetic block was injected into the gum to numb the nerves supplying the tooth. This allowed us then to keep Daisy on the lowest plane of general anaesthesia and provided up to 10 hours of post-operative pain relief as well. Once this had taken effect we performed a surgical extraction by raising a flap of gum over the fractured tooth, drilling away some of the alveolar bone and then levering the tooth carefully out. The bone was smoothed and then the gingival flap was stitched in place with dissolvable sutures to ensure maximum comfort for Daisy. 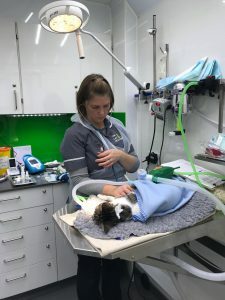 The remaining teeth were then polished and finally Daisy’s anaesthetic gas was switched off and she recovered very smoothly with plenty of pain relief, a warm, cosy bed and lots of TLC! We all know that cats are amazing, but nothing astounds me more than their recovery from a dental procedure. In most cases patients are under anaesthesia for at least an hour and extractions require extensive surgical work that has taken years of training and experience to master. Yet so many cats will wake up and eat an entire bowl of food within an hour of their recovery! Their owners often comment on how much “happier” their cats seem after a dental procedure. Some owners are worried about their cats losing teeth, but in reality cats can easily cope with no teeth at all. The gums quickly heal and harden which is much nicer than the painful and often infected mouth they had before the procedure. In Daisy’s case she was purring and smooching as if to say “phew, that feels much better – thank you!”. 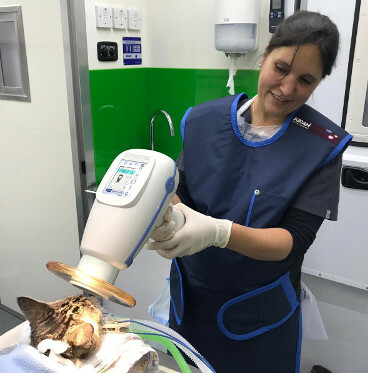 With a few days of pain relief given by the owner at home, Daisy continued to make a full recovery and is now back to loving life after the surgical extraction of her fractured tooth. Dental Disease – How Do You Know if Your Cat is Affected? With dental disease occurring in most of our adult cats, it is likely that your cat will have some form of it at some point in their lives. In Daisy’s case, she had an acute injury and therefore showed us the classic signs that we as humans might expect if we had toothache. In most cases however, especially if the disease has progressed slowly over months or years, cats rarely show any signs of discomfort or pain, so don’t expect them to tell you they have it. 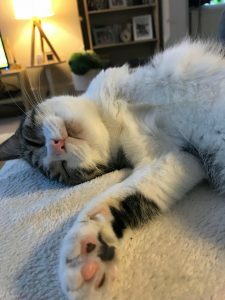 Sometimes cats with dental disease develop smelly breath or change the way they chew their food but it is very uncommon for a cat to stop eating due to dental pain, they just get on with it. Just because your cat is eating well doesn’t mean there isn’t a problem and in fact many times there will be no clinical signs at all so regular dental check-ups are necessary to recognise this painful disease. If you are concerned about your cat’s teeth please get in touch so we can discuss prevention and treatment options to keep your cat’s mouth healthy and pain-free for life!